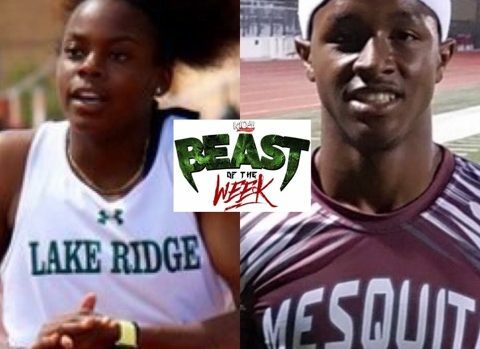 Jasmine Moore (Mansfield Lake Ridge) and Caleb Boger (Mesquite) Named Beasts Of The Week! This week’s K104 “Beast Of the Week” golden spikes go to Jasmine Moore of Mansfield Lake Ridge and Caleb Boger of Mesquite for claiming gold over the weekend! Jasmine Moore (Mansfield Lake Ridge) – It was a record breaking day at the Texas Relays for Jasmine as she jumped 44-1 ft in the triple jump to claim the current national record! Caleb Boger (Mesquite) – Caleb defended his home track over the weekend taking home the 100m (10.42) and 200m (21.43) gold medal at the Mesquite Invitational!